Like its corporate twin, the Chevy Silverado 1500, the GMC Sierra will also come as the new-generation version for the 2019 model year. The current versions of two half-ton trucks debuted in 2014 and recently spy photographers caught prototypes of GM’s trucks. Two models share similar mechanical components and that will be the case for the new generations as well, although we still don’t have specs of the engines which will power new versions. 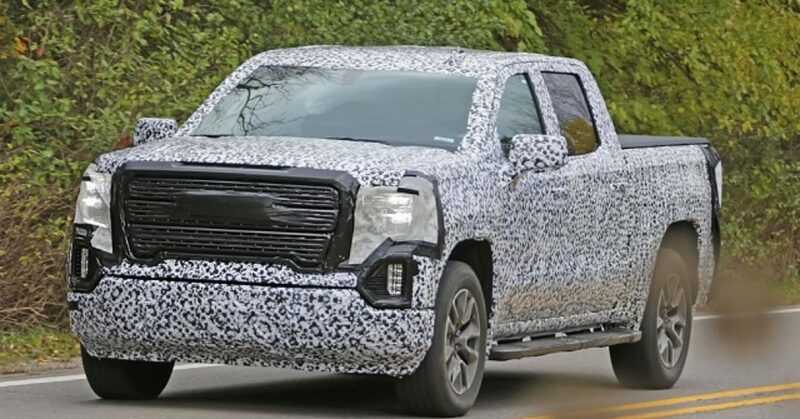 On the other hand, judging by the spy photos, the new 2019 GMC Sierra will further distinguish itself with unique styling and fancier interior. Upgraded tech and safety features will round up the redesign and the model will again be available in high-luxury Denali trim. The upcoming versions of GM’s light-duty trucks will use the GMT T1XX platform which GM will exploit for the future full-size trucks and large SUVs starting from late 2018. The new platform should improve model’s structural rigidity which will also translate to better driving dynamics and towing capability. The new 2019 GMC Sierra should also be lighter than the version it replaces as GM should use aluminum for some body panels. The prototype of this model has relatively flat body panels under the camo and that could indicate the use of aluminum in some sections. Visually, GM will further differentiate two truck models and they will have unique and refreshed front facias. The Sierra will continue with massive grille but the new design has slightly different shape and more pronounced contours. The model will also get new headlights with new LED elements, similar as on the new GMC Terrain crossover. The prototype version also seems to have vertically oriented fog lights instead of the horizontal units on the current version. The profile of the model appears to have flatter wheel arches and taller waistline. On the other hand, the new version will get rear-facing exhausts and new taillights. Interior of the model and equipment are still the mystery. However, we should expect redesigned center stack with the larger touchscreen and reorganized controls. Fresh materials and nice accents will be available on trims which should mimic the currently available options including the top Denali version. The new model will return in three cab styles and bed lengths. GM will also upgrade the infotainment system and safety equipment but more precise details should emerge soon. As for the engine options, the 2019 GMC Sierra and new Silverado 1500 should again rely on the V-6 and V-8 units as the latest reports suggest. New engine versions should be reworked to provide more power and torque plus better efficiency. The new 10-speed automatic transmission should also be available and contribute to the better performance and fuel economy as well. GM could also offer a supercharged V-8 option to go against high-performance Ford. The upgraded chassis and suspension combined with improved engines will also provide higher towing limits. There will also be the off-road-oriented packages with upgraded suspension, underbody protection and all-terrain tires. The new 2019 GMC Sierra should break the covers in early 2018. Expect the price to stay close to the current range.